If you wondering where to buy Google's new Nexus 7 tablet, you've now got a couple of options. As Google announced earlier this week, Nexus 7 is currently available for pre-order online from the Google Play Store. The tablet costs $199 for the 8GB model and 249 for the 16GB model, and will ship in two to three weeks. 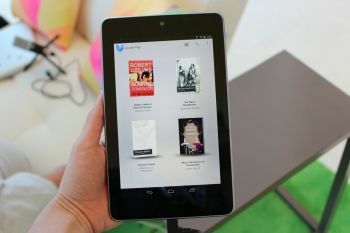 Outside of the U.S., the Nexus 7 will be available in Canada and the United Kingdom first, with other countries to follow. All Things Digital reports, the Nexus 7 will be also be available through brick-and-mortar stores, though Google has yet to reveal any specifics. GameStop is the first U.S. retailer to announce it will be selling the Nexus 7, starting in "mid-July." Only the 16GB model will be available from GameStop, but consumers can defray the cost by trading in games, iOS devices, or other Android tablets. GameStop says it will give an extra 30 percent in trade-in values for anyone who pre-orders the Nexus 7 from their store. This means that if you trade in a 32GB original iPad in perfect condition, you'll get the Nexus 7 for free and will have about $20 in credit left over. Meanwhile, U.K. retailer Ebuyer is also taking pre-orders for the 16GB Nexus 7 (for 199 pounds). Andy Rubin told All Things Digital that Google selling the basic Nexus 7 at essentially zero margins, so 8GB version may be a Google Play Store exclusive. Now that a couple of retailers have announced their plans, others may follow. We'll update this story if other retailers join the pre-order party.